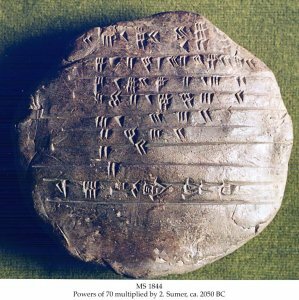 Description	 MS in Neo Sumerian on clay, probably Larsa (before Babylonia), 20th c. BC, 1 round tablet, 11,0x3,5 cm, 9 lines in cuneiform script. 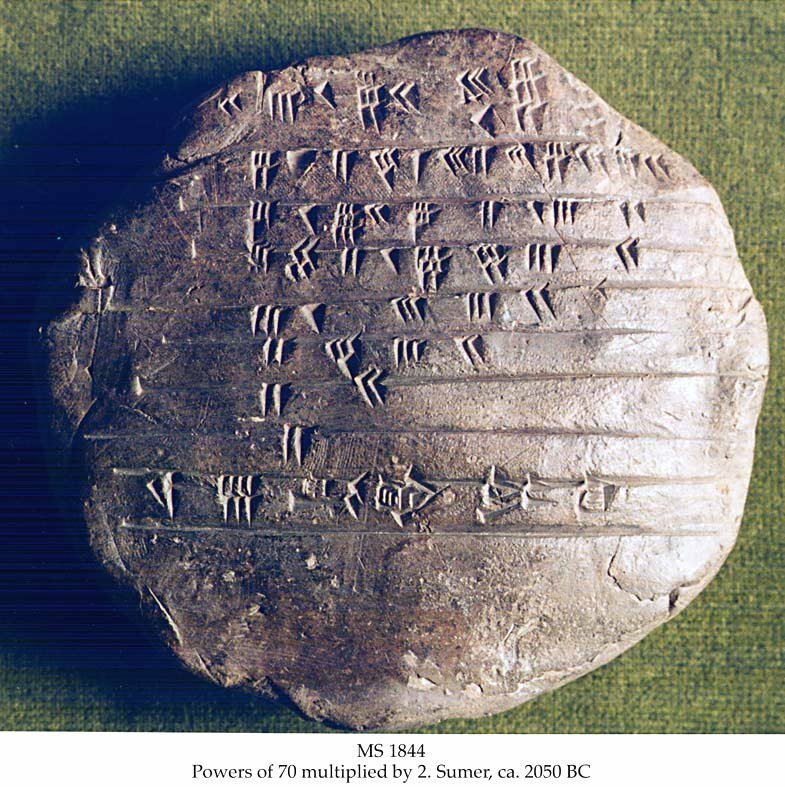 Context	 No other Old Babylonian mathematical text is written from the bottom up in this way. According to the subscript, the number in each line should be equal to the number in the line above it, minus a seventh of that number. Actually, the 7 numbers in lines 2-8 have been computed from the bottom up, beginning with 2 and then making the number in each line equal to the number in the line below it plus a sixth of that number. The sum of the 7 numbers is recorded in line 1. A numerical error in line 3 is propagated upwards, to lines 2 and 1. The recorded numbers look like very large integers, but are actually all a small integer plus a sexagesimal fraction. The youngest of the 7 brothers gets 2, the next gets 2x(1+1/6), the next 2.20x(1+1/6), etc., or read from the top each brother gets 1/7 less than the brother before him. The tablet certainly has been re-used, and there are traces of possible numerical notation from its previous use. Published	 Jöran Friberg: A remarkable Collection of Babylonian Mathematical Texts. Springer 2007. Sources and Studies in the History of Mathematics and Physical Sciences. Manuscripts in the Schøyen Collection, vol. 6, Cuneiform Texts I. pp. 182-186.